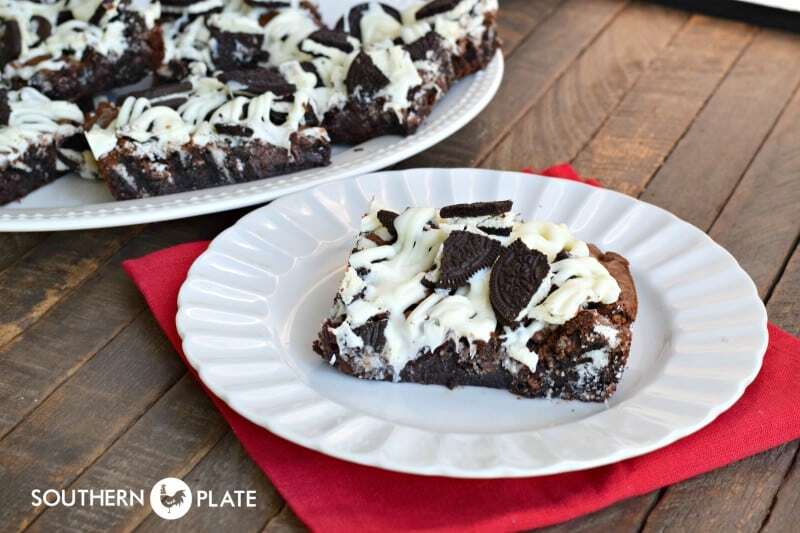 Rich, fudgey brownies studded with chunks of Oreo cookies! This post is in no way sponsored or affiliated with Oreo. Official Notice: To all the peoples of the internets who are panicking that my entire site is going to turn into nothing but low carb recipes – this should set your hearts at ease. I may not be eating this stuff but I sure do like to cook it and I have a teenage boy – which goes hand in hand with a teenage boy’s metabolism. The one thing that is always a win and always welcomed in my house is brownies. Seriously, they’re like Disneyworld, they make everyone happy. I think they may be my son’s first love. The second thing my son loves are Oreo cookies. He is an Oreo nut. I have no idea why. I mean, they’re okay and all that but there has never been a time in my life to date that I have thought “oooh, I really need an Oreo.” Apparently, Brady has an entirely different thought process. 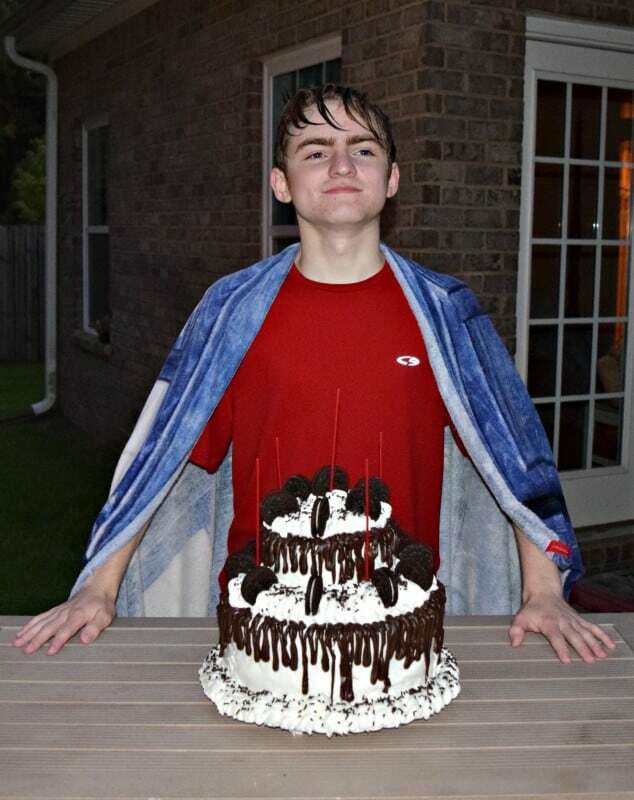 For those following me on Instagram, remember the Giant Oreo Birthday Cake I made him last year? Even Brady took a picture of it. Made me feel like I’d actually done good there for a minute…. Over the years I’ve made him Oreo Pie, Oreo Ice Cream Cake, and even Oreo Cookie Balls. He still gets excited when I come home with a bag of those things. So on his last day of traditional high school, I made him a batch of Oreo Stuffed Brownies to share with friends and his favorite teacher. It was a fitting note of sweetness to close one chapter and open another as he prepares to start early college in the fall. No matter how big he gets, he’s still my baby – and my baby likes Oreos. He also likes asking his mother to bake something at the last minute. So today I’m giving you a recipe that accommodates both of those criteria. Let’s get to it! 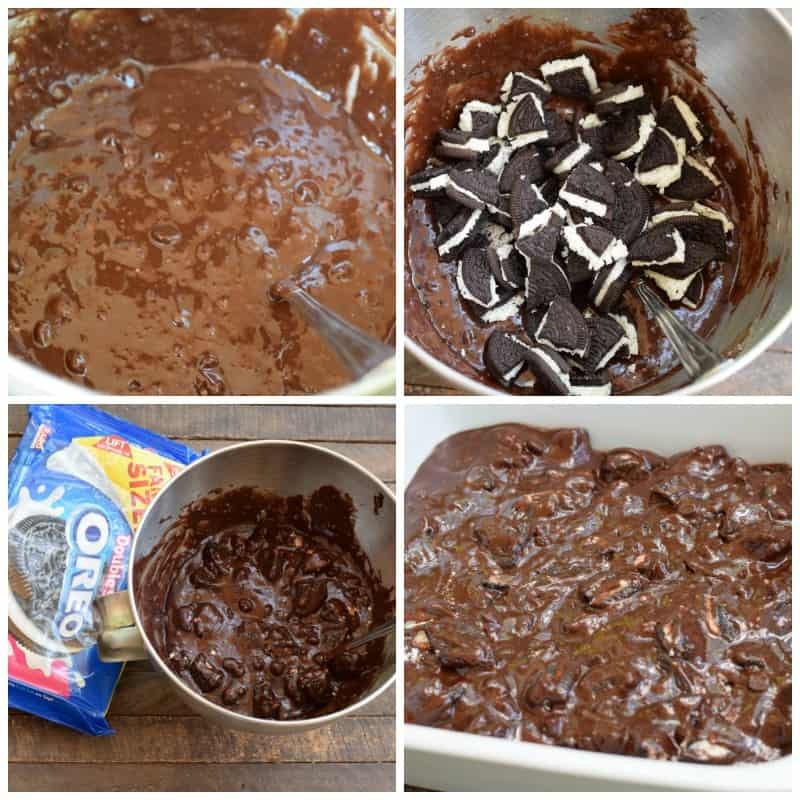 To make these you’ll need: Brownie Mix, Oreos, and White Chocolate Chips. 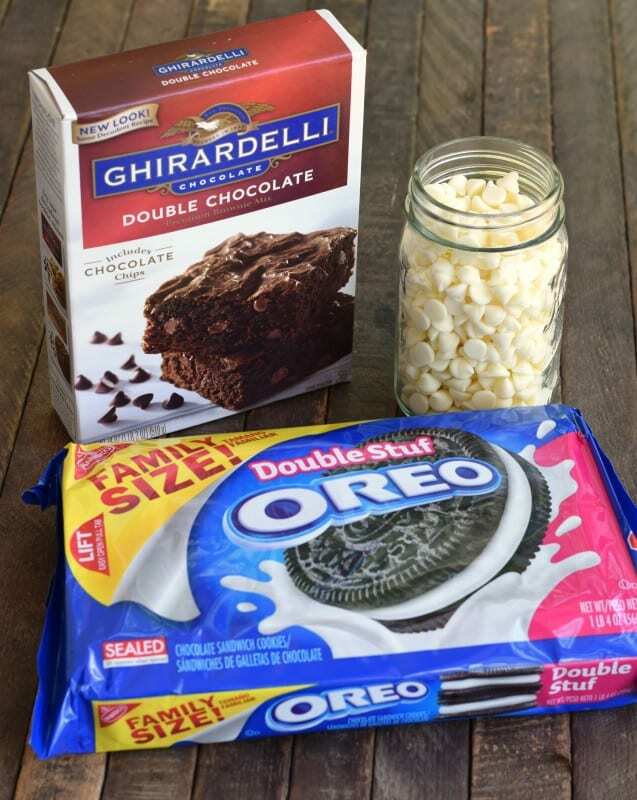 You’ll also need whatever your brownie mix says to add to mix them up according to package directions. Now I LOVE this brand of brownie mix. In fact, if I’m going to make them from a mix this is the only kind I use these days. So that is just to let you know that if you haven’t tried it, you really should. I usually get mine at Big Lots. It runs around $2 a box there but there are two times a year when you can get 20% off your entire purchase (the friends and family sale event) so that is when I stock up on mixes and canned goods there, making this around $1.60 per box. Note: This post is in no way affiliated or a sponsored by Ghirardelli, either. Mix up your brownies according to package directions. Add in ten broken Oreo cookies. Spread batter into greased 8×8 baking dish. Bake according to brownie mix package directions. 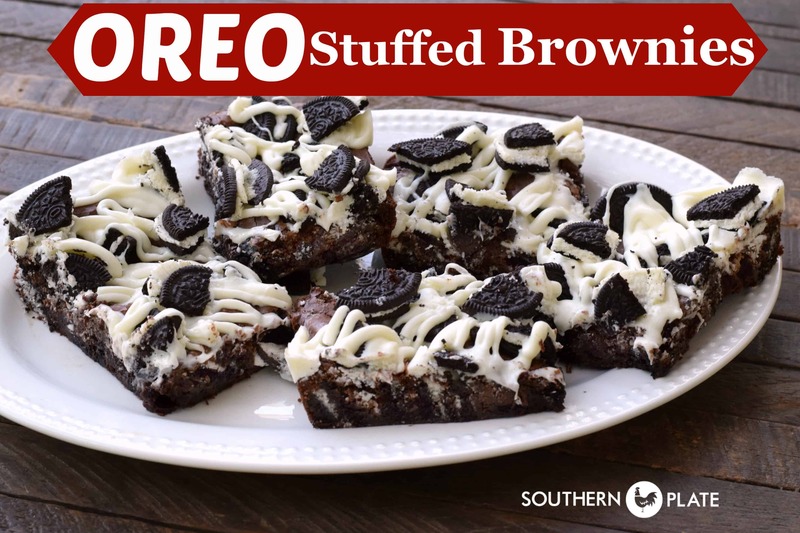 As soon as the brownies come out of the oven, break up the remaining Oreo cookies and put on top. Very gently press them down just a little. Allow to cool completely. Pour chocolate chips into a microwave safe bowl and microwave for thirty seconds at a time, stirring in between each, until melted and smooth. Allow to cool for a few minutes and place melted chocolate into a zipper seal freezer bag. Snip corner off the bag and pipe melted chocolate in a zig zag over the top of brownies. Allow chocolate to cool and harden before cutting and serving. Best of all, these are quick and easy, too! After mixing up brownie mix in a bowl, break up 10 cookies and stir in. 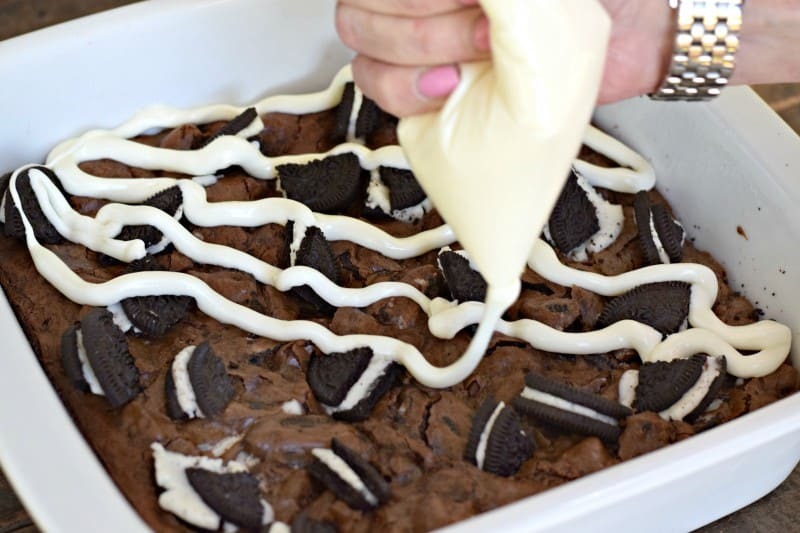 Spread batter in a greased 8x8 baking dish and bake according to time and temperature on brownie mix box. As soon as you remove brownies from oven, break up remaining cookies and place on top, pressing down very lightly. Allow to cool completely. Looks delicious and so easy. I think I will try these for Memorial Day weekend. They sure look like a crowd pleaser. I am curious about your next book. Haven’t heard you mention it much at all. Are you excited about it? I have your first two and am looking forward to this one!!! Hey! It is almost ready for print and comes out October 4th! I’m not talking about it much right now because the Southern Plate Suppers magazine just came out. It’s just easier to talk about one thing at a time, lol! OH MY GOSH! CHRISTY, THIS LOOKS WONDERFUL. WE LOVE OREOS. THANK YOU. HAVE A GREAT DAY! 🙂 I hope you get the chance to make it soon Janice!! Cannot believe your son is going to college. All grown up! Good lookin’ , too!!! Must be all those Oreos. Bless you and your family, Christy. And my grandson will bless you as soon as I get these brownies out of the oven. They smell delish. I can’t believe it either Bee!!! I hope you all enjoy the brownies!!! Just added the ingredients to my shopping list to make this weekend. This definitely will be a hit with everyone. Thank you. left, they look so good. and always seem to come when I need them the most. You’re the greatest! Yum…..is all I can say 🙂 Wish I had one right now….did you at least have just one ? I think I could eat about 5….. 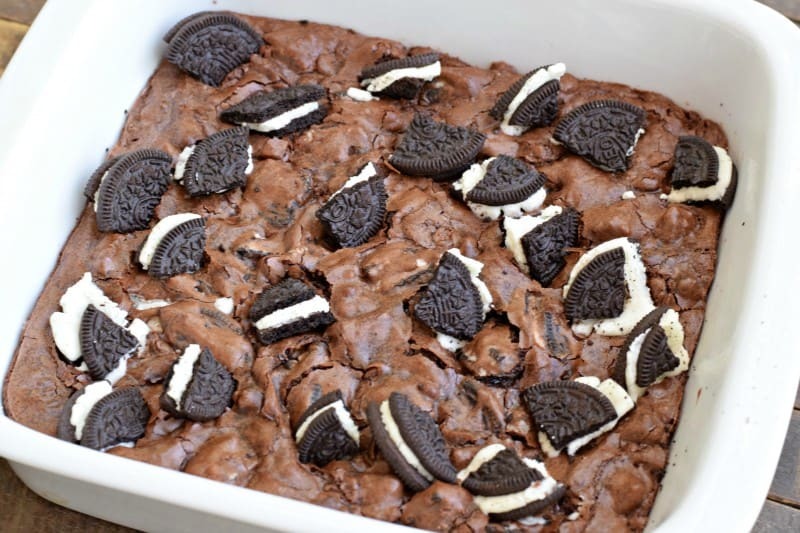 I definitely am going to make these soon…..we all love brownies and them being Ghirardelli is the best ever…. Somehow I did miss this birthday cake you made him…..where was I ????? Is it still on your blog with the recipe ? Thank you!! I hope he thinks he is lucky, but in reality, I know I am the lucky one!! These brownies look amazing!!! Making them for a baseball team party!!!! You will be the hit of the party Beth!! Looks delicious. I need help. I’ve made the brownies but my white chocolate chips will not melt correctly. Don’t know what I’ve done wrong. I did check the date on the chips and were fresh. It may be what the chips are made of that is causing the problem I’m afraid. 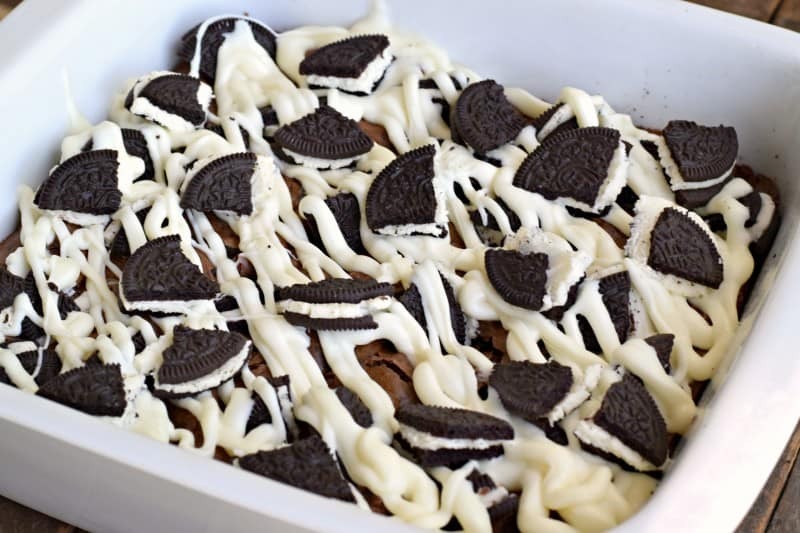 I would just scatter them on the top of the brownies and put the pan in he oven for a new minutes for them to stick. I made a “special” trip grocery shopping just to get the ingredients for this. My problem is breaking up those Oreos without eating them haha.